The Little Bourke / Hardware Lane is one of the most lively and busy areas of the CBD, an oasis of low pedestrian scale, historic buildings, full of cafes, bars, shops, businesses and homes, and you’d think it would be protected, but its actually rather patchy. 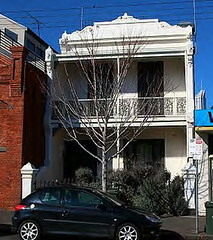 After years of lobbying, its due to mostly become a heritage precinct, which hasn’t formally happened yet (though interim HOs were recently applied), and there are height limits, but only covering parts – there’s a 15m limit along Hardware Lane itself, and a new 40m limit along Elizabeth Street – but that leaves a gap inbetween on Little Bourke, where right now there are TWO high-rise proposals ! One would involve the facading of the early modern c1940 Chart House for an 18 level project, while the other would see the nice 1920s Melbourne Building demolished for a 23 level tower. The issue here is that we would not only lose heritage buildings, but the towers, both on the north side of the street, would mean that Little Bourke Street and the laneways to the south would be overshadowed. Currently the north-south lanes enjoy sunlight exactly at lunchtime, even in winter, but the 35 storey tower in particular would cast a shadow over Rankins Lane, casting it into near permanent gloom. Existing CBD height limits were looked at in the 2015-2016 ‘Central City Built Form Review’ by the Ministry of Planning, which firmed them up, and recommended that other areas, like the rest of the Hardware Lane precinct, should maybe have them too – but in the two years since, nothing has happened, and now of course developers have taken advantage of the lack of controls. Surely its time to say that there are enough high-rise towers and that at least this one popular corner of the city can stay low scale ? We’ve written to the Lord Mayor to urge Council to take a stand, saying that if planning controls aren’t strong enough, and the only way to save the amenity of the area is to buy the properties or pay compensation to the owners, then we think this is a price worth paying. 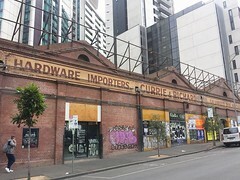 This lovely 1923 building is an important part of the heritage precinct of Little Bourke/Hardware Lane, and should be investigated for heritage protection urgently. I also object to its demolition for a large tower, which will overshadow the precinct and destroy what makes it attractive in the first place. This c1940 unusual is an early example of modernism, and has a level of detail, especially the shopfronts, that adds to qualities of the heritage precinct. It should not be demolished or greatly altered. I object to the construction of a tower here, which will overshadow the precinct and together with the tower at 360 Little Bourke, will mean Little Bourke Street and the laneways off it will be overshadowed and unattractive, destroying the amenity of the lively part of the CBD. I think it’s about time we said enough is enough, the Little Bourke Street/ Hardware Lane area should be protected from tall towers dominating the streetscape and overshadowing this popular precinct. This is very much a case where developers are drawn to an area for its popularity and then destroy what made it good in the first place. Please act before it’s too late.